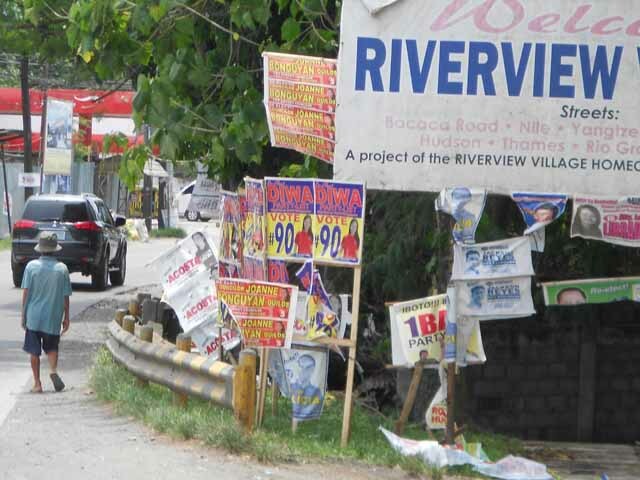 Elections…More Fun in the Philippines. – Beware the Comfort Zone! 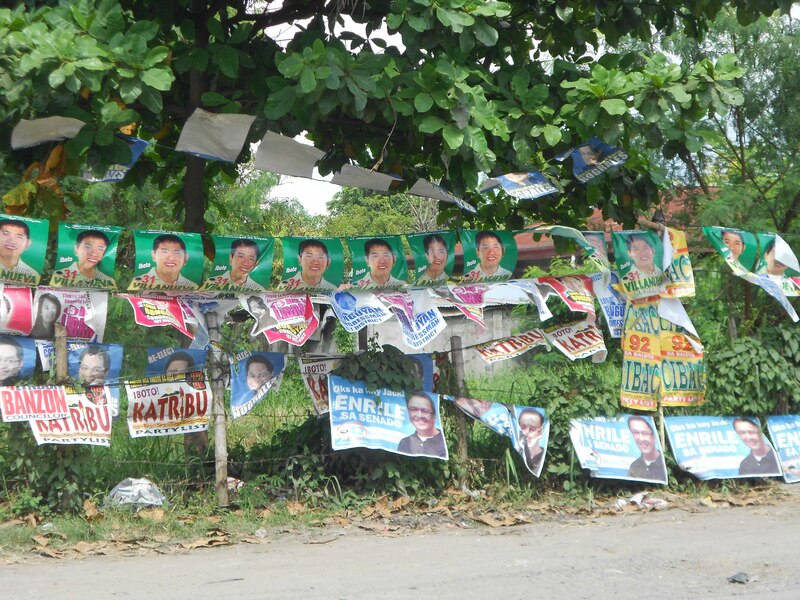 Elections…More Fun in the Philippines. Election time has come to the Philippines! Next week, on May 13, people will flock to the polls for midterm elections, where a number of positions in the Senate, House of Representatives, and local governments will be decided. This is our first election experience here, and while we can’t vote, we have been part of the whole experience. We have not been immune to reams of flyers tucked into our gate, and people passing out flyers to us as we walk around town. I suppose we look local? The spirit of elections here is the same as in the States, candidates state their position, people show their support through banners and buttons, and there are political commercials on the TV and airwaves. But, I guess that’s where the similarities end. Campaign season here is limited to 100 days. I was thrilled when we first learned this! “Thank goodness!” I thought. “No two year ad campaigns, three short months and we’re done!” Other limits include ad time spent on the TV and radio airwaves. 120 minutes is all each candidate is allowed, and while I don’t watch much TV, or hardly ever listen to the radio outside of an occasional taxi ride, my life has been noticeably void of the phrase, “I’m Jose Rodriguez, and I approve this message”. Limits are also placed on the amount of money spent on the campaign, period. All these limits seem to add up to a quiet, peaceful election season. What can I say, people here are very efficient, and have found a way of fitting two years of campaigning into three short months, with very limited funding. So what’s the cheapest form of advertising? Banners, signs, and billboards. Lots and lots and lots of them. They have covered the town (and the country as a whole I’m guessing), it’s difficult to not see at least one or two in any direction when you step outside. It’s usually more like dozens…or hundreds…of faces staring at you, shilling for your vote. And, no, one sign won’t do. To prevent another candidate from blanketing a wall or fence with their name, supporters feel the need to cover an entire area with theirs. Kind of like marking territory, political graffiti if you will. The question that has been asked amongst several of us who are experiencing our first election season is, “what happens to all these signs after May 13?” I have a feeling we’ll be seeing the faces of these people for a very long time…winners and losers alike. If the “wall pollution” isn’t obnoxious enough, many of the signs are made of lightweight poly tarp fabric, not paper, so they will not biodegrade any time in the next, say, 1000 years. On the plus side, some are repurposed into porch shades for the local walk-up stores (called a sari sari), some into seats for tricycabs (local motorcycle taxis that seat several people), but the vast majority will probably wind up in the ocean, landfills, and left hanging until there is nothing but a faded, shredded wad of debris. In case the banners aren’t enough to influence your vote, motorcades roam the city as well. 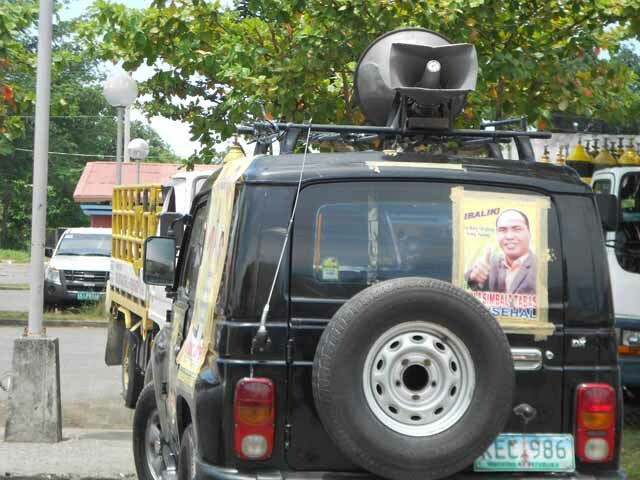 They are usually individual vehicles, that have a megaphone strapped to the top, playing a custom jingle for the candidate, that is guaranteed to get stuck in your head. Mission accomplished earworm masters, I have one in my head as a type, and I don’t even know what the words are. Too bad I can’t vote. They range from songs to the tune of “Call Me Maybe”, or “La Bamba”, to “Copacabana”. Yes, for real. I wonder if Carly Rae Jepsen had any clue that she would have the honored role of deciding the political future of the Philippines. There are a few original songs as well, showing a bit more effort and creativity. 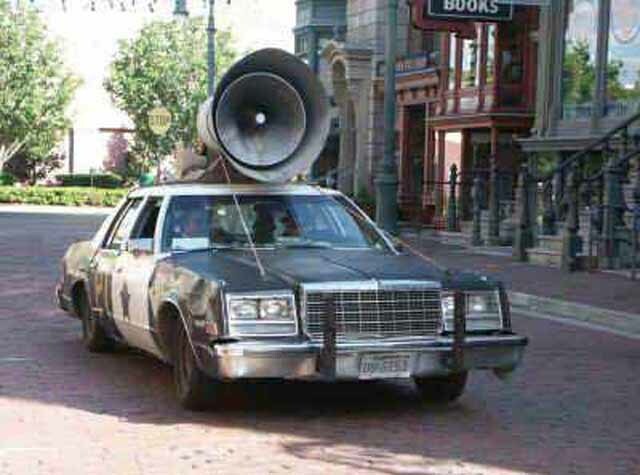 The get ups remind me of the infamous Bluesmobile, but unfortunately, election season is longer than “One Night Only”. Quick, find 5 things different between these two pictures! Huh, neither could I…I think all the candidates should wear sunglasses and fedoras though. And I really realllllly wish Davao had a “Bob’s Country Bunker”. And the darkest, more serious, side of election season is unfortunately, the murders and kidnappings that occur. The worst so far this season was here on Mindanao, where 10 family members and supporters of a small town mayor (his daughter included) were ambushed and killed while traveling on a mountain road. Several more, including the mayor, were injured. There have been a handful of murders and other violent crimes against political candidates, this is not uncommon. Kind of puts into perspective all the “harmful” mudslinging campaigns that are carried out elsewhere, at least those involved usually stop at words. It’s pretty cool though to see how passionate people are about elections here, since elsewhere we take it for granted, and have a very passive attitude towards the whole process. I was talking to a friend the other day, and she said that it’s a hassle to go vote, and she doesn’t really like to go do , and she wonders how much of a difference it made in the country…but she quickly added, “but we must do it, it’s important”. Well said. Previous Post What Loose Ends?! Next Post Lucky Charms=Vegetables. Eat Up.